Last month, Huawei and Apple came up with their new flagship chipsets. While the Apple A12 Bionic powered the latest iPhone XS, iPhone XS Max, and iPhone XR, the HiSilicon Kirin 980 will be introduced with the Huawei Mate 20 and Mate 20 Pro smartphones. With the upcoming Galaxy S10 and Galaxy S10 Plus smartphones, the new flagship chipsets from Qualcomm and Samsung should be introduced to the market. Recently, the Qualcomm Snapdragon 8150 has been spotted on the Bluetooth certifications website. Samsung might introduce the Exynos 9820 as the successor to Exynos 9810. All these new-gen mobile processors will be built on the 7mn FinFET process. 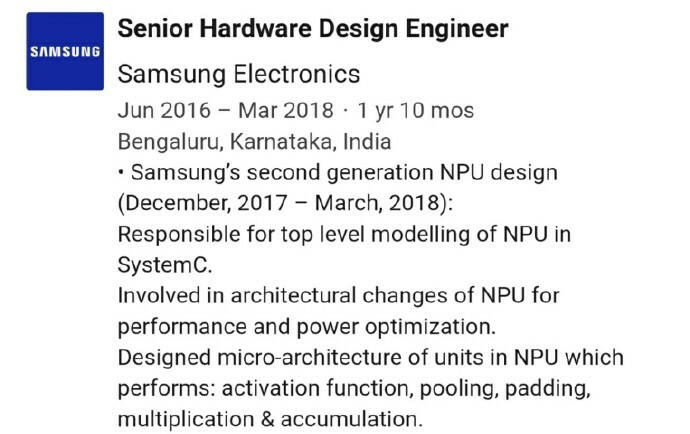 According to the resume of Samsung’s ex-employee, the company might introduce a dedicated NPU (Neural Processing Unit) with the rumored Exynos 9820 SoC. The company seems to have started working on the second-generation NPU in December 2017. Huawei first introduced a dedicated NPU in the mobile processors with the Kirin 970. Even the latest Apple A12 Bionic also came with a dedicated 8-core Neural engine. As of now, the details of the Samsung Exynos 9810 SoC are very scarce. Stay tuned on PhoneRadar to know more about the upcoming Exynos SoC.